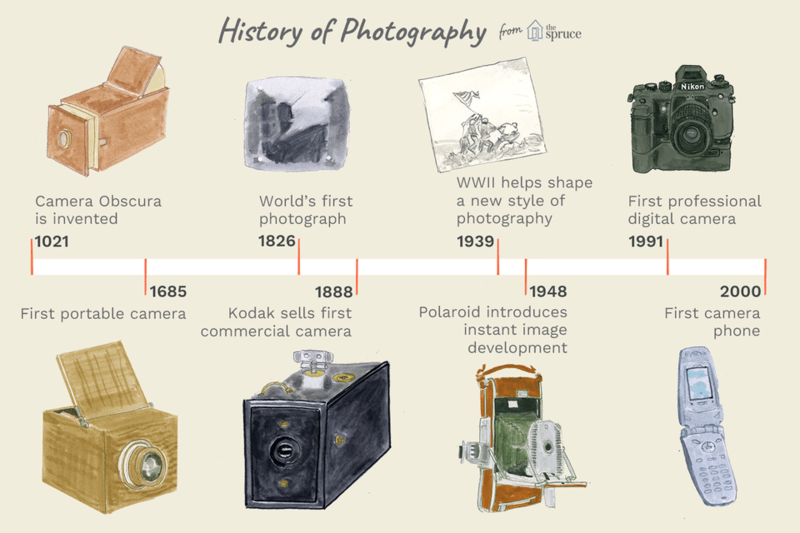 Photography has come a long way in its relatively short history. In almost 200 years, the camera developed from a plain box that took blurry photos to the high-tech mini computers found in today's DSLRs and smartphones. The story of photography is fascinating and it's possible to go into great detail. However, let's take a brief look at the highlights and major developments of this scientific art form. The basic concept of photography has been around since about the 5th century B.C.E. It wasn't until an Iraqi scientist developed something called the camera obscura in the 11th century that the art was born. Even then, the camera did not actually record images, it simply projected them onto another surface. The images were also upside down, though they could be traced to create accurate drawings of real objects such as buildings. The first camera obscura used a pinhole in a tent to project an image from outside the tent into the darkened area. It was not until the 17th century that the camera obscura became small enough to be portable. Basic lenses to focus the light were also introduced around this time. Photography, as we know it today, began in the late 1830s in France. Joseph Nicéphore Niépce used a portable camera obscura to expose a pewter plate coated with bitumen to light. This is the first recorded image that did not fade quickly. Niépce's success led to a number of other experiments and photography progressed very rapidly. Daguerreotypes, emulsion plates, and wet plates were developed almost simultaneously in the mid- to late-1800s. With each type of emulsion, photographers experimented with different chemicals and techniques. The following are the three that were instrumental in the development of modern photography. Niépce's experiment led to a collaboration with Louis Daguerre. The result was the creation of the daguerreotype, a forerunner of modern film. A copper plate was coated with silver and exposed to iodine vapor before it was exposed to light. To create the image on the plate, the early daguerreotypes had to be exposed to light for up to 15 minutes. The daguerreotype was very popular until it was replaced in the late 1850s by emulsion plates. Emulsion plates, or wet plates, were less expensive than daguerreotypes and required only two or three seconds of exposure time. This made them much more suited to portrait photographs, which was the most common use of photography at the time. Many photographs from the Civil War were produced on wet plates. These wet plates used an emulsion process called the Collodion process, rather than a simple coating on the image plate. It was during this time that bellows were added to cameras to help with focusing. Two common types of emulsion plates were the ambrotype and the tintype. Ambrotypes used a glass plate instead of the copper plate of the daguerreotypes. Tintypes used a tin plate. While these plates were much more sensitive to light, they had to be developed quickly. Photographers needed to have chemistry on hand and many traveled in wagons that doubled as a darkroom. In the 1870s, photography took another huge leap forward. Richard Maddox improved on a previous invention to make dry gelatine plates that were nearly equal to wet plates in speed and quality. These dry plates could be stored rather than made as needed. This allowed photographers much more freedom in taking photographs. The process also allowed for smaller cameras that could be hand-held. As exposure times decreased, the first camera with a mechanical shutter was developed. Photography was only for professionals and the very rich until George Eastman started a company called Kodak in the 1880s. Eastman created a flexible roll film that did not require constantly changing the solid plates. This allowed him to develop a self-contained box camera that held 100 film exposures. The camera had a small single lens with no focusing adjustment. The consumer would take pictures and send the camera back to the factory for the film to be developed and prints made, much like modern disposable cameras. This was the first camera inexpensive enough for the average person to afford. The film was still large in comparison to today's 35mm film. It was not until the late 1940s that 35mm film became cheap enough for the majority of consumers to use. Around 1930, Henri-Cartier Bresson and other photographers began to use small 35mm cameras to capture images of life as it occurred rather than staged portraits. When World War II started in 1939, many photojournalists adopted this style. The posed portraits of World War I soldiers gave way to graphic images of war and its aftermath. Images such as Joel Rosenthal's photograph, Raising the Flag on Iwo Jima brought the reality of war home and helped galvanize the American people like never before. This style of capturing decisive moments shaped the face of photography forever. At the same time that 35mm cameras were becoming popular, Polaroid introduced the Model 95. Model 95 used a secret chemical process to develop film inside the camera in less than a minute. This new camera was fairly expensive but the novelty of instant images caught the public's attention. By the mid-1960s, Polaroid had many models on the market and the price had dropped so that even more people could afford it. In 2008, Polaroid stopped making their famous instant film and took their secrets with them. Many groups such as The Impossible Project and Lomography have tried to revive instant film with limited success. As of 2018, it remains difficult to replicate the quality that was found in a Polaroid. While the French introduced the permanent image, the Japanese brought easier image control to the photographer. In the 1950s, Asahi (which later became Pentax) introduced the Asahiflex and Nikon introduced its Nikon F camera. These were both SLR-type cameras and the Nikon F allowed for interchangeable lenses and other accessories. For the next 30 years, SLR-style cameras remained the camera of choice. Many improvements were introduced to both the cameras and the film itself. In the late 1970s and early 1980s, compact cameras that were capable of making image control decisions on their own were introduced. These "point and shoot" cameras calculated shutter speed, aperture, and focus, leaving photographers free to concentrate on composition. The automatic cameras became immensely popular with casual photographers. Professionals and serious amateurs continued to prefer to make their own adjustments and enjoyed the image control available with SLR cameras. In the 1980s and 1990s, numerous manufacturers worked on cameras that stored images electronically. The first of these were point-and-shoot cameras that used digital media instead of film. By 1991, Kodak had produced the first digital camera that was advanced enough to be used successfully by professionals. Other manufacturers quickly followed and today Canon, Nikon, Pentax, and other manufacturers offer advanced digital SLR (DSLR) cameras. Even the most basic point-and-shoot camera now takes higher quality images than Niépce’s pewter plate, and smartphones can easily pull off a high-quality printed photograph.